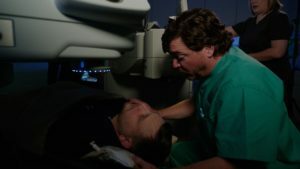 Our exciting all-laser iLASIK procedure features the same CustomVue laser technology approved for LASIK on the US military, NASA astronauts and Top Gun fighter pilots. 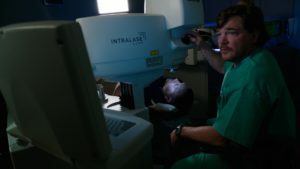 Wallace Eye Associates is proud to be the first and only practice in CENLA to offer patients laser vision correction in a fully dedicated laser suite designed specifically for LASIK. CustomVue also allows our surgeons to customize your LASIK procedure specifically for your lifestyle and visual needs. Each LASIK procedure is as custom as your fingerprint and DNA. iLASIK at Wallace Eye Associates is FDA-approved for the correction of NEARsightedness, FARsightedness and Astigmatism. The actual laser portion of your LASIK procedure takes less than 60 seconds to perform. 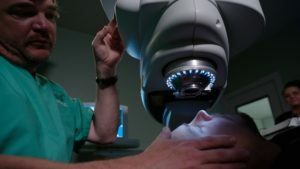 Our LASIK system features advanced eye tracking technology to help insure the best possible outcomes and help reduce any fear or anxiety patients might have. Clear Vision – Anytime, Anywhere! The first step to finding out whether or not you are an ideal candidate for LASIK is to schedule a complimentary LASIK consultation. During your consultation, advanced diagnostics will be used to measure the thickness and curvature of your cornea to help determine your candidacy.